There are so many different ways to impress an audience when telling a story. Detailed sets and well made costumes can really get you in the right mood and whisk you away to the fantasy land of the creator’s choice. Enhancement of the atmosphere is key. Enhancing the atmosphere without the extravagant trimmings and elaborate details is exceptional. For such an experience, one should attend Striking 12. 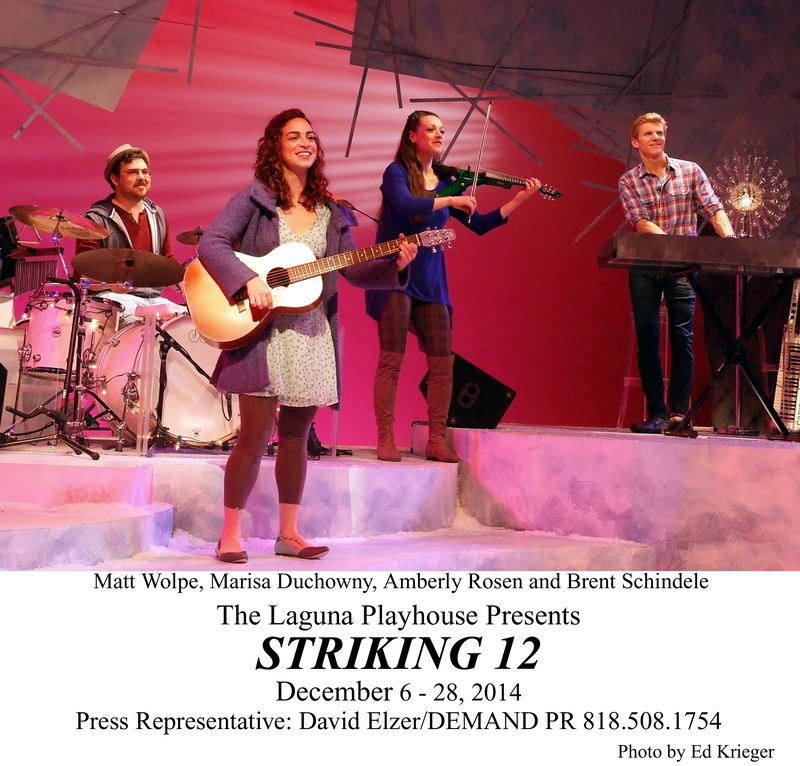 Striking 12 is a visually simple show with four actors. Each performer stands up onstage playing their respective musical instruments, both singing and speaking periodically to tell their story of a young man tired and bored with the mess that often comes along with New Year’s Eve, and so decides to stay home. With a few interactions and his consideration of the classic Hans Christian Anderson story The Little Match Girl, the young man begins to reconsider his view of the holiday spirit and the treatment of other people. With all of the instruments set up in plain view, and with a slightly electrical rock n roll feel, this is just as much a concert as it is a play. The musical talent featured here is exceptional. The performers display all of the familiarity and ease of a band going on tour. Some songs just seem better than others but this is mostly just left up to taste. Even classic songs like “The Little Drummer Boy” are given modern revamps, and it somehow works. The songs dealing with the feelings of The Little Match Girl create some food for thought, showing us the possibility of an angry side to this worn down character who in the original story is treated wholly as a timid victim of circumstances and the coldness of mankind. Of course “angry” does not automatically equal “deep” but it is an interesting change of pace. It should also be noted that the song she sings is one of the most exciting moments in the show. Whether or not fans of the original short story will agree with this depiction remains to be seen, but it could easily be considered further insight into the mind and heart of someone with agency and a will of their own to live–the little match girl. The actors remain still at the appropriate times, enabling them to effectively tell the story without over-done costumes and sets. The weakest moments are undoubtedly a few of the more forgettable songs, but the stronger songs and the impressive acting make up for it. This is a solid holiday show that speaks to the mind and the heart. 1nIOBJ Muchos Gracias for your blog article.Really looking forward to read more. Great.